Prevent the bending, warping, and twisting caused by humidity or dryness with Best's unique museum-quality Pro-Bar System. 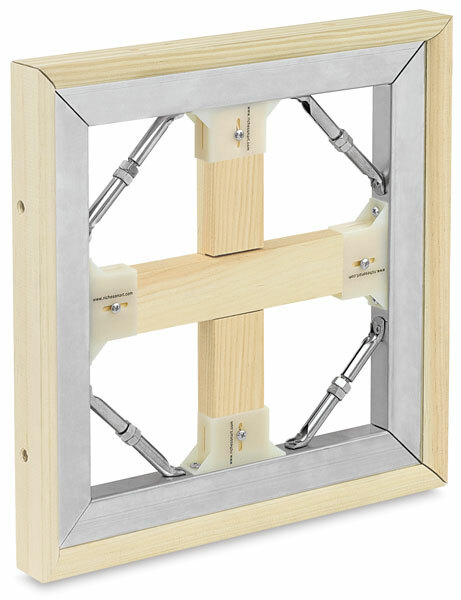 Stable and strong, this framing system is designed with a full 1/2" relief between the canvas and stretcher bars to prevent any ghost impressions on your stretched canvas. The combination of wood and recycled aluminum creates a stronger, more rigid support — great for large-format works. The stretcher bars are made of kiln-dried pine, which is attached to a specially milled 3/32" aluminum bar. The pine bar offers a smooth, rounded edge and a solid surface for stapling or tacking. The warp-resistant bars measure 1-3/8" thick and 1-7/8" wide. Best Pro-Bar Steel Corners are required to complete the system. Use four corners per frame, or eight corners for optimum strength. As an additional option for quick, easy canvas adjustment, use Best Corner Keys. The Best Pro-Bar System is made in the USA. Note — Notching requires a custom order. To place a custom cross brace order, please use the form in the Resources tab. You can print and fax the form; print, scan, and email the form; or fill it out in Adobe Acrobat Reader and send by email. Blick by Best Assembly Kit — Designed specifically for use with the Best Pro-Bar Stretchers, this kit is a cost-effective alternative for the name brand steel corners required to assemble a Best Pro-Bar System stretcher frame. 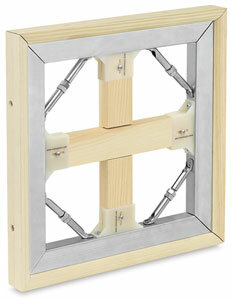 Everything you need is in the kit — eight steel corners, four corner keys, and eight screws. 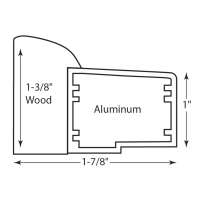 Steel Corners for Stretcher Bar, Pkg of 4 — These steel corners are required for the Best Pro-Bar System. Use four corners per frame, or eight corners for optimum strength. Best Corner Keys, Pack of 4 — Use these corner keys as an optional feature with the Best Pro-Bar System, or with any other wooden stretcher bar, to quickly and easily adjust canvas tension. Tighten or loosen your canvas with the turn of a nut. The keys are easily installed into the pre-drilled holes on the Pro-Bar stretcher bars using the eight included screws. To view a PDF showing suggested cross brace configurations, please click here. To place a custom cross brace order, please use the form found here. You can print and fax the form; print, scan, and email the form; or fill it out in Adobe Acrobat Reader and send by email. ™ Best is a trademark.® Richeson is registered trademark.  Pro-Bar is a trademark. Note — Order your cross brace length in the same size as the stretcher bar length you want to span — ex. if you have a 18" × 48" frame, purchase an 18" brace to support the longer side. Best Aluminum Stretcher Bars are the straightest, most scale-able bar that meets the needs of artists who work small or very large. They are easy to assemble and allow for both traditional stretching where the canvas is side-stapled, as well as a gallery-style stretching, where the canvas is back stapled. The corners, keys and cross-braces give artists the most professional canvas for their fine painting and artwork.